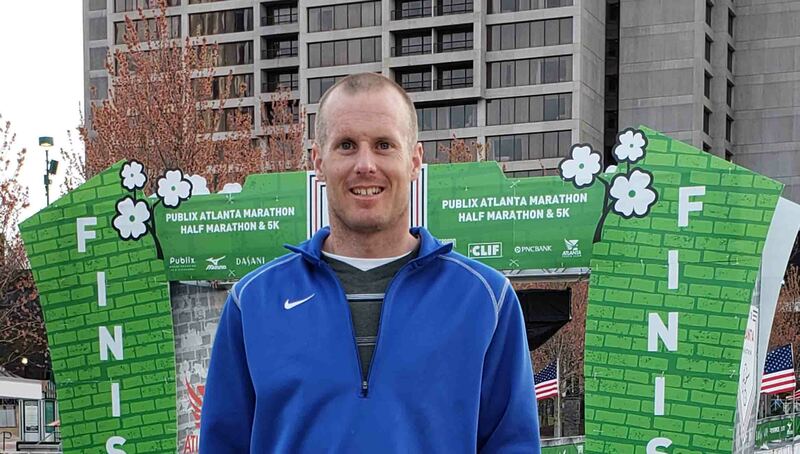 Mobridge runner Curtis Huffman checked another marathon off his list when he ran in the Publix Atlanta Marathon in Atlanta, Ga., on March 17. It was Huffman’s 21st marathon. He’s run in 20 states in his quest to run races in all 50 states. The St. Patrick’s Day marathon and half marathon had more than 16,000 runners combined. The full marathon had 1,593 races. One thousand five hundred and eighty-four of those runners finished behind Huffman as he raced to ninth place with a time of two hours and 46.02 seconds. That is a 6:20 per miles pace for the 26.2-mile marathon. Huffman said the race started at 7 a.m. so it was dark for the first eight miles. He said the course was fairly flat with lots of little inclines and corners. The course was downtown Atlanta and went by the Mercedes Benz Dome where the Atlanta Falcons play football. Huffman said that he and Casey visited the Coca-Cola plan and the Georgia Aquarium as part of their mini vacation. “As with all the marathons, it’s always nice to go and visit, but you really appreciate the joys of small-town South Dakota when you return home. Even if it is colder and has more snow,” said Huffman. Marathon number 22 is on tap for June 2 in Casper, Wyo. “I am excited for this race as my parents are going to make the trip with us and our kids will get to experience the marathon for the first time,” said Hoffman.